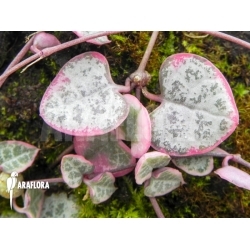 This cultivated form of Ceropegia has heart-shaped leaves with special markings that differ from one plant to another, ranging in colour from deep to pale green. The parachute-shaped flowers form an ingenious fly trap. Rather than digesting insects, Ceropegia linearis subs woodii variegata uses these bio agents as pollinaters. Ceropegia linearis subs woodii variegata is a cultivated version of Ceropegia woodii that is native to South Africa, Sawziland and Zimbabwe. Ceropegia, inearis subs woodii variegata is not found in the wild. 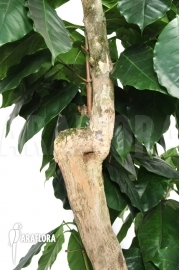 It is an attractive house plant with an unusual appearance but is fairly straighforward to care for. Forgetting to water it once is not an issue. The flowers trap small flies and retain them for a couple of days until they are covered in pollen. The flies consume the plant's nectar to ward off starvation during the time they are trapped. Eventually the flower changes position and the small hairs preventing the fly from escaping point in the opposite direction therby releasing the fly so it can pollinate other specimens. Ceropegia linearis subs woodii variegata is best placed in bright light but not in direct sunlight. It can cope with a wide range of temperatures but thrives at room temperature. Ceropegia linearis subs woodii variegata can not deal with frost or lengthy periods of low temperatures. It blooms from late summer until autumn but under the right circumstances it will continue to flower far into winter. It needs soil with proper drainage that can be left to dry out between watering sessions. Ceropegia do not like their roots standing in water and have a tendency to rot if the soil is too moist.